Modern fantasy or romantic idyll? These two properties have a lot to offer. The challenges of life in the English countryside are highlighted by the sale of two very different estates—one the fantasy creation of a restless 20th-century genius, the other a diverse, 290-acre estate dating back more than 1,000 years and centred on the partly restored ruin of a Grade I-listed mansion that was once the grandest house on the Isle of Wight. Joint selling agents Smiths Gore (01451 832832) and Knight Frank (01789 297735) have been inundated with calls from potential purchasers following the announcement of the sale of an intriguing portfolio of properties amassed by the late Felix Dennis in and around the village of Dorsington, Warwickshire, between 1987, when he moved to The Old Manor, and his death there in June last year. The properties—including the manor itself, a spectacular leisure complex, a Georgian farmhouse, various village and estate houses and a number of sites for development or conversion —are being offered in up to 11 lots, at prices ranging from £300,000 for a semi-detached, two-bedroom cottage to £9.515 million for the entire estate. Additional land is available with some of the lots by separate negotiation. Felix Dennis’s The Old Manor estate at Dorsington in Warwickshire includes the thatched main house at £1.75m. Dennis had a passion for trees and the proceeds of the sale will go to the Heart of England Forest, a charitable trust set up to re-create Shakespeare’s Forest of Arden on 5,750 acres of land acquired around The Old Manor over the years. The former ‘wild man’ of publishing, for whom extreme living was the norm, was totally committed to the project and planted the millionth tree there in September 2013. He originally bought The Old Manor as a retreat from his manic life in London, but came to love it so much that it became his permanent home. Dennis loved to entertain, but didn’t really want guests staying in his house, so he gradually bought up neigh- bouring houses and developed them into Caribbean-style guest cottages. 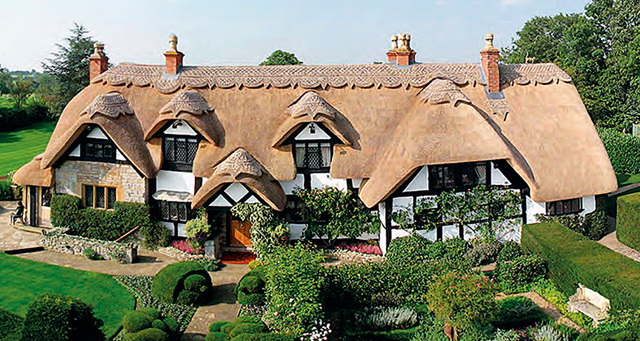 The thatched, Elizabethan, four-bedroom main house, listed Grade II, dates from the early 16th century and was originally five workers’ cottages. Priced at £1.75m, it stands in about nine acres of gardens, grounds and paddocks, with glorious unfettered views over the Warwickshire countryside towards Meon Hill and the Ilmington Downs. Felix Dennis’s The Old Manor estate at Dorsington in Warwickshire includes Highfield at £2.45m, the ultimate party barn. 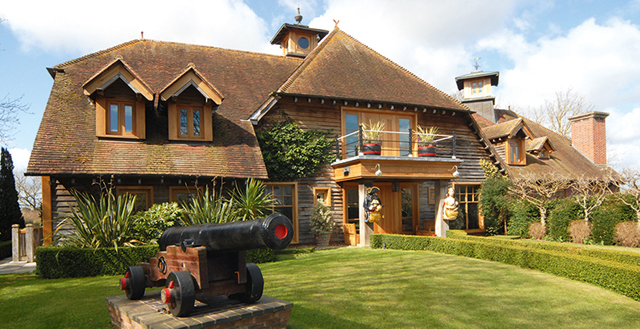 Dennis’s pièce de résistance was Highfield, a bungalow that he transformed into the ultimate party barn at a cost of almost £5m and which, at the time of its construction, was the biggest barn to be built of green oak in England for 300 years. Themed on the storyline of Treasure Island, his childhood favourite, the 12,000sq ft complex boasts a vast aquarium full of tropical fish, a swimming pool with an island planted with full-size palm trees and pirates climbing the rigging as well as other eccentricities, including a working red telephone box, an outdoor Caribbean bar and a full-size chessboard in the garden. It comes with planning consent for conversion to residential use and is on offer at a realistic £2.45m. A substantial building of interest to lovers of Georgian architecture is handsome Manor House Farmhouse, listed Grade II, which stands in 1.2 acres of gardens on the edge of the village and has three reception rooms, a kitchen/breakfast room, five first-floor bedrooms, four attic bedrooms and two bath/shower rooms. It has been used as a holiday let and needs refurbishing, but has the potential to create a ‘truly lovely house’, says Robert Pritchard of Smiths Gore, who quotes a guide price of £875,000. 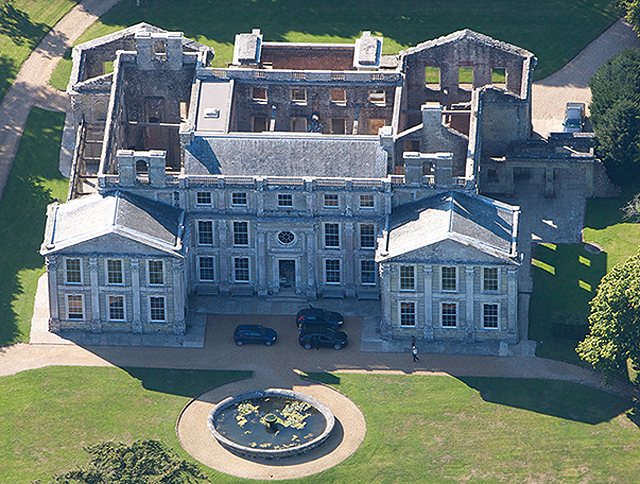 The 290-acre Appuldurcombe estate on the Isle of Wight includes the romantic ruins of Appuldurcombe House. Potential abounds within the historic confines of the 290-acre Appuldurcombe estate between the villages of Wroxall and Godshill, near Ventnor, Isle of Wight, much of it already realised by the current owners, who have lived at Appuldurcombe for 30 years and are now retiring. For sale through the Winchester office of Savills (01962 841842) at a guide price of £6m for the whole, or in four lots, the diverse working estate, which dates from before the norman Conquest, currently comprises two farmhouses, seven holiday cottages, a working aviary, a cafe, a children’s indoor soft play area and the romantic ruins of Appuldurcombe House. The magnificent Baroque mansion, listed Grade I, designed by the architect John James and set within a Capability Brown landscape, was rebuilt in 1701 on the site of an earlier Tudor house by Sir Robert Worsley, whose family owned the estate for 300 years. The house was substantially altered and extended some 70 years later by Sir Robert’s profligate great-nephew, Sir Richard Worsley, whose disastrous marriage to, and subsequent divorce from his wife, Seymour Fleming (whom he reputedly married ‘for love and £80,000’), are set to feature in a BBC2 drama, The Lady in Red, later this year. The East Wing of Appuldurcombe House has been re-roofed and partially restored and is a popular wedding venue. Their scandalous divorce case cost Sir Richard his reputation, and the Worsleys their family fortune, and when Sir Richard died in 1805, Appuldurcombe passed to his niece’s husband, Charles Anderson-Pelham, 1st Earl of Yarborough, the founder of the Royal Yacht Squadron at Cowes. The estate was eventually sold in 1855 and Appuldurcombe House was run, first as a hotel, then a boys’ school, and later a temporary refuge for exiled French Benedictine monks. used as a billet for troops during both World Wars, the house was badly damaged in the Second World War, when a German Dornier dropped its last mine close to the house before crashing into the nearby hillside. Although still mainly a shell, the East Wing has been partly restored and re-roofed, and now serves as a popular wedding venue throughout the year. Other estate buildings have been converted or restored as holiday lets, including The Gatehouse, The Retreat (a one-bedroom cottage), Stable Cottage (the former stables) and The Coach House, all listed Grade II.